What started as a working-class neighbourhood has seen waves of gentrification since the 1960s. With it came an interest in the civic pride, and an awareness that the suburb’s unique aesthetics must be protected. Suburbs with a high concentration of historic buildings also come with unique wiring needs. Randwick Electrical is proud to bring cutting-edge conveniences to every building in Paddington while maintaining the integrity of the landscape. Maybe you’re hosting an art gallery opening or planning a neighbourhood block party. If you’re going to address a large group of people in an outdoor setting, you need great audio/visual backing you up. Our Paddington electricians can take the guesswork out of audio/visual equipment, so you can focus on what truly matters: engaging with everyone who attends your one-of-a-kind event. Some contractors put you at risk by being under-insured. Our electricians are covered by $20M Public Liability Insurance and offer a 12-month guarantee on all the services we provide. 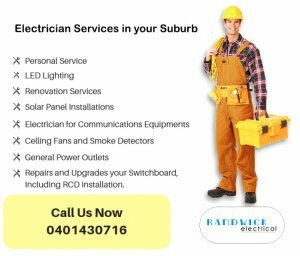 We also have all the latest tools and technology, and current know-how to provide you with the most efficient and professional electrician service in Paddington. Whether you want to retrofit an older building with solar panels, or make a new development all-around efficient, Randwick electricians can assist you in achieving your energy goals.